The Westminster Kennel Club Dog Show, now in its 143rd year, started yesterday with over 2879 dogs competing across 203 breeds and varietes. The real show began last night and can be seen on TV and streaming. 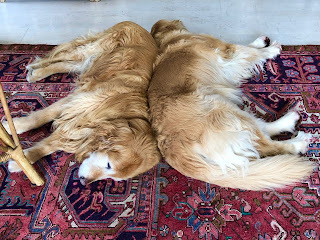 In honor of the Dog Show and Valentine's Day, and keeping in mind how important dogs can be to mysteries and in our lives, I am posting a recipe for Valentine's Day Dog Treats that you can make for your 'special' friend. The illustration above is from Tyler Humphreys at TylersWorkshop (posted with permission). Here's a link to the etsy site where you can buy this card or order lots of other cards, pictures and sculptures. 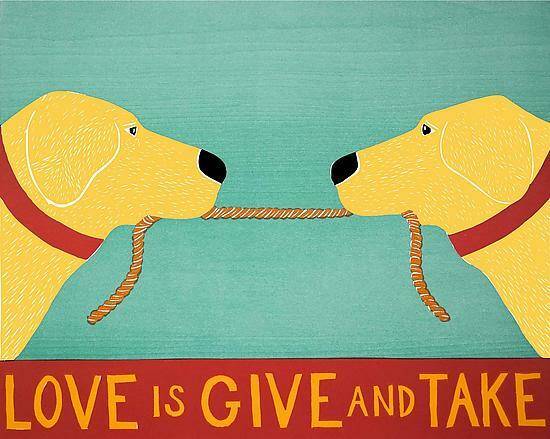 I love this Valentine's Day Card because it reminds me of my late pets, Topper and Belle au Bois Dormant. And, to keep this post to a mystery theme, here's a link to the Mystery Readers Journal Animals in Mysteries issue. Available as a PDF or hardcopy. 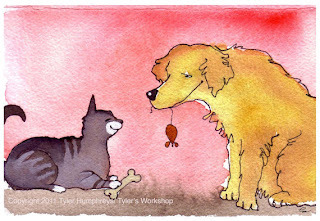 Here's a link to an article by Spencer Quinn, author of the Chet the Dog series. Valentine's Day is all about chocolate. If you want Chocolate People treats, here's a link to Walker's Shortbread Scottie Dogs with Muddy Boots. This is a HUMANS ONLY RECIPE. Be sure and keep the chocolate away from Fido. I posted an article at Halloween about Dogs, Chocolate and Halloween Treats: A Dangerous Combination, and the same warnings are in effect for Valentine's Day. 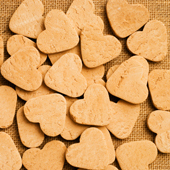 Finally a Valentine's Day Dog Treat Recipe for your four footed faithful friend. Preheat oven to 350 degrees. Grease cookie sheet using 1 tablespoon of vegetable oil. With clean hands, roll dough out to 1/4 to 1/2-inch thickness and use heart-shaped cookie cutter in honor of the holiday. If you have a larger dog (or a piggy dog like Topper) use a larger heart-shaped cookie cutter, Perforate the cookies with a fork down the middle to break apart easily after baking. Instead of a cookie cutter, you can always roll the dough into 1/2 to 2-inch balls and place them one inch apart on the greased cookie sheet. Bake for 25 - 35 minutes until they turn golden brown. Baking times will vary based on size of treats, altitude, and your oven. Cool cookies on wire racks, as far away from your dog as possible. After treating your dog, store the rest in the refrigerator or freeze until the next visit from Cupid.